A former boarding school pupil was "launched" down the stairs by the head teacher and school owner, a court has heard. 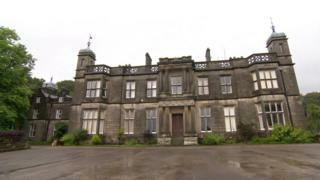 The witness said he landed on his back after the two men threw him at Underley Hall School near Kirkby Lonsdale. Derrick Cooper, 77, the former owner of the school, denies six assault charges and two of child cruelty. Three other men are also on trial at Carlisle Crown Court accused of assault at the school in the 1970s and 1980s. The former head teacher accused of throwing the boy down the stairs is not fit to stand trial, the court heard. The ex-pupil told jurors he had spray-painted an anagram of his initials in an off-limits area of the school. The next day he said he encountered Mr Cooper, of Hillberry Green in Douglas, Isle of Man, and the head teacher. He said the two men asked him about the graffiti then picked him up to carry him to an office. The witness said: "We came to the stairs, at the top. I was resisting. I was kicking. I was a big heavy lad as well." The two men exchanged a look which the ex-pupil thought meant "enough's enough", the court heard. He said he was then "launched down the stairs" and felt "panic". He added: "I landed on my back. I was winded and couldn't move." When it was suggested under cross-examination by Peter Wright QC, for Cooper, that the incident didn't happen, the witness replied: "It is the truth, everything." David Hadwin, 71, of Raygarth Gardens in Kirkby Lonsdale.